Our Infamous Chicago collection celebrates the city's colorful history of notorious figures. From time to time it may be necessary for us to make substitutions for items or containers. Rest assured, we know there is no substitute for quality. Replacement products will always be a comparable item of equal or greater value. And always local! This gang of gifts is one no one will mind you hanging out with. The just-published Speaking Ill of the Dead: Jerks in Chicago History ​is a delightfully wicked look at 25 badly behaved characters who shaped the colorful history of the Windy City. 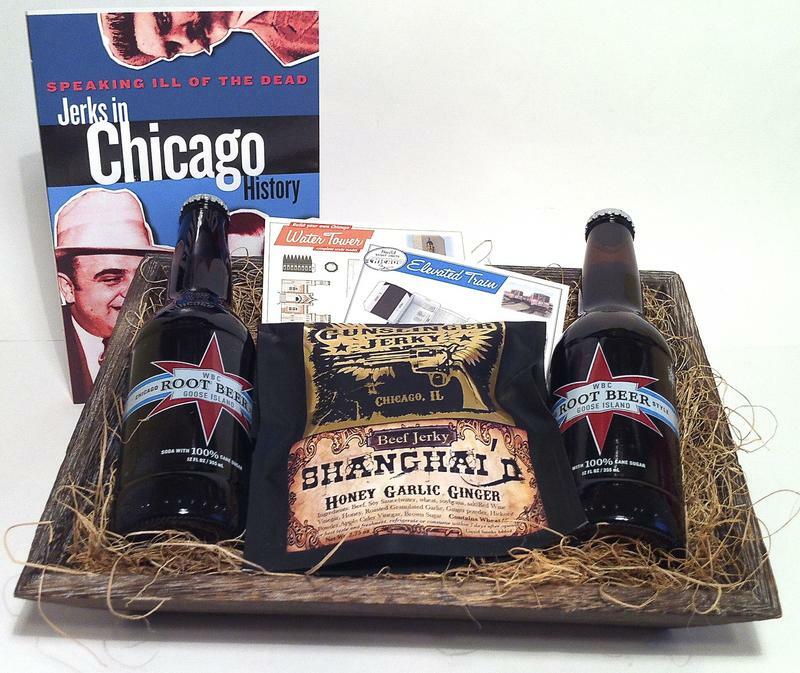 Since every good crook book needs some quality cohorts, we've matched the book with two Build Your Own Chicago postcards, a package of Gunslinger Jerky's artisanal all-natural, hand-cut beef jerky and two 16 ounce bottles of root beer from Chicago's Goose Island Brewery. Don't be a jerk, share one with someone. We guarantee your satisfaction. If you are not satisfied for any reason, let us know and we will promptly send a replacement gift or provide you with a refund or credit. Email Us Here or call Customer Service at 312-719-1948. We understand the importance of corporate gift giving to show appreciation to valued clients and employees. No matter the season, Send Them Chicago gifts offer the perfect way to show your support and appreciation for the region’s local artisans and foods while also showing appreciation to those who matter most to the success of your business. Our gift experts can help you customize the perfect distinctively Chicago gift for any business gifting occasion or meeting. It's not about us, really. It's about this city: Chicago was love at first sight for our founder when she transplanted here nearly twenty years ago. Since that time she's been passionate about sharing uniquely Chicago gifts that celebrate the city's history, people, places, and spirit with friends, family and business contacts. Send Them Chicago brings that passion to you. We hope you'll enjoy discovering and sharing Chicago at our site and that you will Gift Local every chance you get. We ship nationwide via UPS Ground with estimated delivery within 2 to 5 days (surcharge and extended timeframe for Alaska and Hawaii shipments). Please call us at 312-719-1948 for expedited delivery options and rates. Find standard shipping rates and information on our Customer Service page. © 2014 Send Them Chicago, LLC. All Rights Reserved. Proudly Made in Chicago.